Pasternack 60 GHz transmitter modules open up ultra high speed, high bandwidth data transmission for widespread use. 60 GHz waveguide modules utilizes the unlicensed millimeter wave spectrum of 57 GHz to 64 GHz. Our wireless 60 GHz transmitter components are ideal for meeting the high speed data transmission needs of companies and developers. These silicon germanium (SiGe) chip based 60 GHz modules are lower cost and easier to integrate than existing competing products. 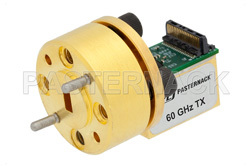 Pasternack’s 60 GHz V band wireless solution is equally effective at a fraction of the cost and can be connected to off-the-shelf WR-15 waveguide through the UG-385/U flange. Lower cost, ease of use and ability to attach standard components make these 60 GHz Tx units practical for a wide range of configurations and budgets. High speed point to point wireless 60 GHz communication links allow for low cost, gigabit wireless throughput for a number of different applications. 60 GHz wireless point to point solutions include telecommunications “last kilometer” distribution, telecommunications cellular backhaul, millimeter wave wireless gigabit ethernet data communications, building-to-building high speed networks and mesh-based LAN infrastructures. High bandwidth wireless video streaming and transport of large uncompressed files. High speed wireless video and audio solutions from MP3 to HDTV to 4K video and beyond. Large bandwidth wireless 60 GHz MM wave eliminates the need for uncompressed HD video compression software and cabling hardware. 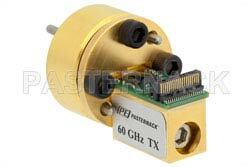 802.11ad WiGig development is very cost effective using the Pasternack 60 GHz transmit modules. IEEE 802.11ad WiGig wireless development is not only lower cost but also quick to implement. 802.11aj is also supported with these same WiGig developer modules. Other 60 GHz wide band, high bandwidth wireless applications such as RFID, RADAR, radiometry, remote sensing and various millimeter wave V Band solutions are supported.